Under the Indian Act (Canada), First Nations individuals and bands are generally exempt from PST when they purchase or lease goods or purchase services on First Nations land (i.e. reserve land or former reserve land now part of treaty lands). 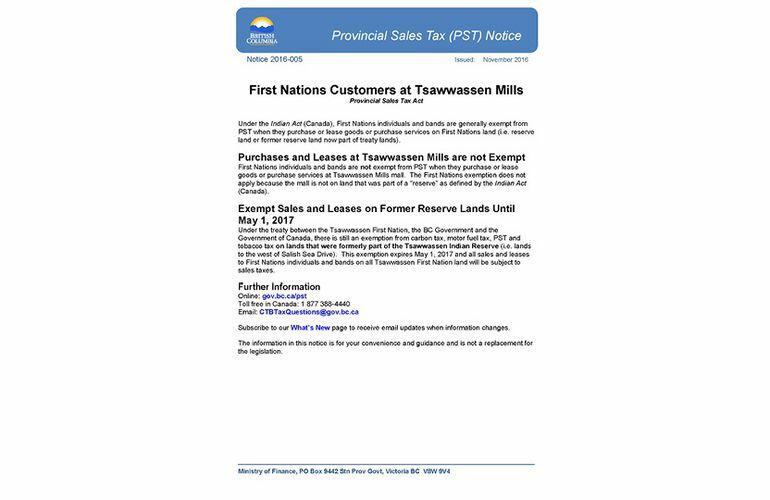 First Nations individuals and bands are not exempt from PST when they purchase or lease goods or purchase services at Tsawwassen Mills mall. The First Nations exemption does not apply because the mall is not on land that was part of a “reserve” as defined by the Indian Act (Canada). Under the treaty between the Tsawwassen First Nation, the BC Government and the Government of Canada, there is still an exemption from carbon tax, motor fuel tax, PST and tobacco tax on lands that were formerly part of the Tsawwassen Indian Reserve (i.e. lands to the west of Salish Sea Drive). This exemption expires May 1, 2017 and all sales and leases to First Nations individuals and bands on all Tsawwassen First Nation land will be subject to sales taxes. Tsawwassen First Nation (TFN) Urban Treaty determines the sales tax exemption for Native Status Card Holders and it does not apply at Tsawwassen Mills. 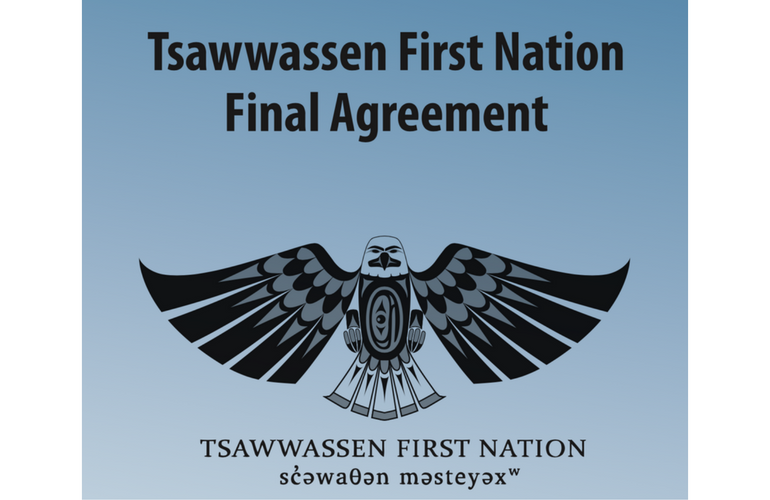 Under the Tsawwassen First Nations Final Agreement, the sales tax exemption is applicable only on the former Reserve. The lands on which Tsawwassen Mills is developed, was property of the Crown added to Tsawwassen Lands at a later date and therefore not part of the original Reserve. Sales tax exemption for TFN members and other status Indians does not apply. Now, for larger items (such as vehicles and boats), retailers may be asked to make arrangements whereby they deliver the product and exchange funds on Tsawwassen Lands that was formerly the reserve (just across Salish Sea Way). On those lands, they would get the exemption. Reference: Chapter 20, clauses 16-20, of the Tsawwassen First Nation Final Agreement.